pure coat Semi Gloss Sealer is a clear solvent based sealer with a semi-wet look finish emphasising textured surfaces with barrier protection to reduce stains and damage to the surface. pure coat Semi-Gloss Sealer penetrates the surface providing deep protection and increasing the durability of the surface. 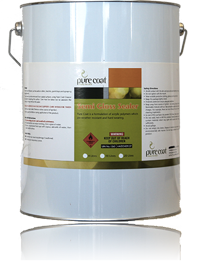 As with all pure coat Products, pure coat Semi Gloss is resistant to the harsh WA climate and is resistant to UV light. Enhances the colour of pavers by creating an enduring “wet look”, enabling paving to retain its new appearance for years rather than months, as well as masking efflorescence bloom and preventing dusting. The reduction in surface moisture reduces the likelihood of moss, weed, fungus and mildew growth. Resists staining by spilled materials such as sump oils, fats, food, tyre marks, chewing gum etc. which enables easier cleaning and maintenance of coated areas. Water runs off rather than soaking into the coated surface. the life of the treated surface. pure coat is clear and does not yellow in sunlight. pure coat locks in the jointing sand in brick paving. All surfaces and affected areas must be clean from dust,loose material and mortar spills. Thoroughly hose down all affected areas. areas, particularly stained, dirty or moss covered surfaces. pressure clean it off immediately. Allow no traffic on cleaned areas prior to sealing application. Coat Sealer by roller or airless spray gun. Second coat to be applied as soon as first coat is dry. Depending on weather conditions, pure coat Sealer will dry underfoot within 1-3 hours. Heavy traffic areas (eg. Driveway/Carport) require up to three days drying time. Clean brushes, rollers and airless spray guns with pure coat Cleaner. A coverage rate of approximately 5-8m2 per litre on a smooth surface, however the porosity and texture of the surface and method of application may vary the coverage rate. Any work carried out by persons other than pure coat Applicators cannot be guaranteed by pure coat . To achieve a non-slip surface, apply pure coat Highly Slip Resistant Sealer. Avoid use near naked flames or other sources of ignition. Ensure good ventilation during application of the product.